The festive season is here and kitchens all across the nations are buzzing with activity. Right from the preparation of savoury delights to that of desserts and sweets, kitchen appliances are busy helping out the homemakers in every nook and corner of the nation! This brought us to an interesting question? 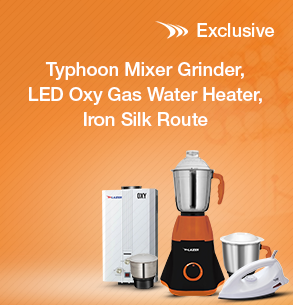 After all, which are the most used and the best kitchen appliances from Lazer India. We decided to look out for the answer, and were truly delighted to find it, so much so, that we couldn’t keep ourselves from sharing it with you! Thanks to the bulk of the cooking, most homes opted for the environment and budget-friendly Lazer India Induction Cooker. Elegant in design, this home appliance easily blends in with almost every type of kitchen interior. However, the most appreciated features of the cooker are the incredible 3-hour timer and a 24-hour Present option. Now if that doesn’t act as a true friend in the kitchen, we don’t know what will! Frankly speaking, this one was a no-brainer! After all, whether one loves to cook traditional Indian delicacies, or is inclined to relish continental delights, no food preparation is complete without the use of this impeccable kitchen appliance. It is the sheer functionality that this food preparation device offers, which makes it comparable to a food processor, that too, only at half the price! The next to make it to our list was one of the most efficient and small kitchen appliances, the chopper. To think of it, what could possibly be better than this handy, unbreakable device to depend on for a hassle-free experience in the kitchen? And yes, thanks to its energy efficient motor, this device also helps in skimping on those mounting electricity bills. At Lazer India, we firmly believe that time saved in the kitchen is time earned for yourself and your loved ones. So, if you happen to have missed out on any of our best selling kitchen appliances online, make sure to order them at the earliest possible and enjoy those much desired moments of love and laughter with your family over scrumptious meals!